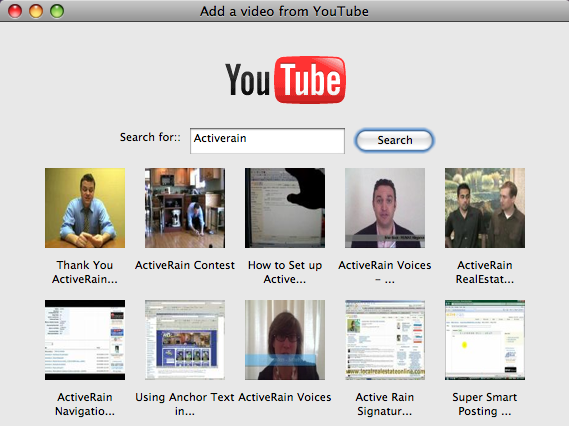 Jeremy Blanton just did a great video tutorial for members showing how you can add video to your AR Blog posts. He requested that I do a tutorial on how to embed a video into the comments of a post like TLW did on his. We get this request much more frequently now, so I guess it’s time. NOTE: Any and ALL members can use Firefox as a browser without conflicting with their use of Microsoft’s Internet Explorer Browser, in fact, both browsers can be open at the same time and running side by side. So this is really for ALL ActiveRain members. The Firefox Browser allows you to have add-ons or plug-ins. 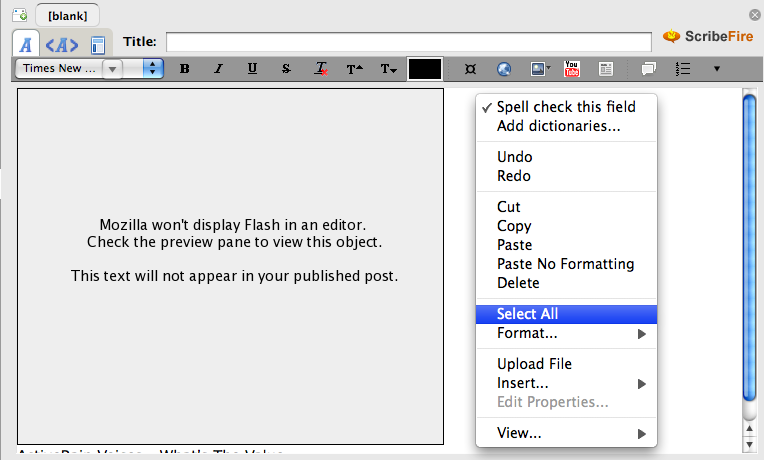 The first thing you’ll need to do is go to ScribeFire.com and download their add-on for your browser. 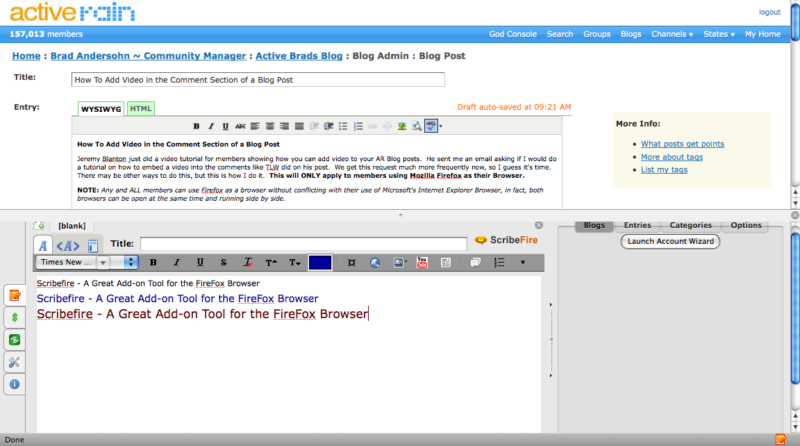 ScribeFire is an extension for the Mozilla Firefox Web Browser that integrates with your browser to let you easily post to your blog. You can change font colors and re-size them and you’ll find many other great uses for this little add-on, but today we’ll focus on adding video to comments. In the toolbar of Scribefire’s add-on, you’ll see a Youtube Icon , click on it. Click on the video you wish to add to your comment, then click the OK Button. This will add a video box in the Scribefire screen. Now just “Right Click” your mouse in the Scribefire Screen next to the video and choose the option to “Select All”. 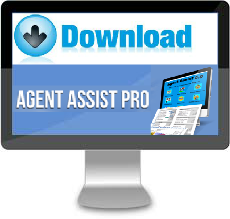 “Right Click” your mouse again and select “Copy”, then go to the comment box of the ActiveRain post, “Right Click” a third time and select “Paste”. To re-size videos, you’ll need to edit the HTML and just change the Width and Height which I’ll show you here. Lastly, highlight and copy and paste the edited code into your comment and you’re done. Now you’re probably telling yourself, “Self, this is a lot of work just to add a video to a comment on ActiveRain!” Yes, it is. Having an occasional video show up in a comment or two of your post or someone else’s is fine, but if everyone did this to your Blog post, could you imagine how long it would take for that post to load? Video will slow down the load time of the authors Blog so please keep this in mind if you decide to add a video to another members post. Also be sure that if you do add video, that it is not copyright protected material and it is relevant to the authors post and topic.